Bring the enduring beauty of ceramic tiles into your home or business by shopping at our flooring store. At our showroom, we maintain a massive inventory of ceramic tile flooring products from trusted manufacturers. Visit our showroom to browse the displays and find the perfect tile flooring for your building. With so many options you are sure to find the floors that suit your needs in looks, performance, and price. Since ceramic tile come in a wide variety of colors, sizes, and styles, it is easy to find the perfect match for your room. Whether you want a traditional, elegant look or something more contemporary and bold, we have something for you. From eye-catching patterns to neutral tones, everything you could possibly need to renovate your floors is in stock at our store. Not sure what kind of ceramic tile floor would look best? You are welcome to explore our showroom for inspiration and talk to our knowledgeable employees. Discuss your flooring project with our store associates and they will be happy to make recommendations based on your design goals, existing décor, and budget. Just use a mop or damp towel to soak up the fluids and wipe it clean. Choose a durable floor that stands the test of time. 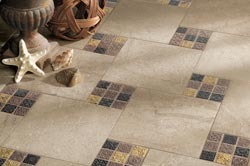 A tile floor made of ceramic is perfect for areas that experience a lot of wear-and-tear or heavy foot traffic. Whether you have children and pets or countless customers coming through your doors, ceramic tile resists scuffs, scrapes, and other types of damage. In addition to being highly durable, this flooring is also water-resistant and easy to clean. Ceramic is specially constructed and installed to ward off moisture damage, so it is ideal for wet areas like kitchens, bathrooms, and laundry rooms. Homeowners and business owners alike also love that ceramic is a breeze to clean up after spills. With its lasting beauty and easy maintenance, choose ceramic tile as a worthy investment for any building. Even years after installation, it still looks brand new. To find out even more advantages of ceramic, talk to the helpful experts in our store. Ensure your new floor looks its best by utilizing our professional installers. Our store is proud to offer affordable and meticulous installation services by our own team of certified contractors. There is no need to search for the right contractor to do the project. Our contractors are trained to correctly install every products sold in our store, including all of our ceramic tile options. No matter which brand or style of ceramic tile you choose for your floor, our installers get the job done right in no time at all. Installing ceramic tile floors requires precision to ensure every tile is placed perfectly and no pieces get cracked. Let our installers handle all the hard work for you so that you can enjoy your beautiful new floor as soon as possible. If you have any questions or concerns about our installation services, please speak with one of our store associates for answers. Contact our store for more details on the ceramic tile flooring products we carry. We proudly serve customers throughout Flower Mound, Dallas, Lewisville, Highland Village, and Grapevine, Texas.